Preparations for the walk are progressing slowly, partly because logistics is, well, not exactly my core skill, but largely because I am trying to do everything else I would have been doing over nine months in six. However, on my last few mainland visits I have begun to talk with various people in Wales and elsewhere, and I’m sure things will work themselves out when it comes! 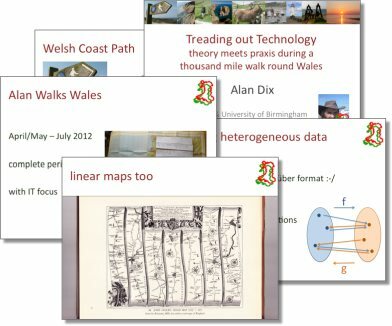 Part of my last trip included a trip to Swansea where I gave my first presentation about the Wales walk, “Treading out Technology: theory meets praxis during a thousand mile walk round Wales”, at the FIT lab. (abstract below). As well as seeing old friends including Parisa and Harold, I also met Andrew Morgan who is doing a PhD at Swansea Met on circular walks and community use of mobile applications on the Wales Coas Path, and also John Ashley who writes a regular column on local walks in The Bay Magazine1. John has recently published a book “Ashley’s Walks” based on the column. The walks are gloriously illustrated with own photographs and sprinkled with local history. One of the things that has been taxing me is how traditional paper maps, guidebooks and other location related materials can be linked with mobile experiences, not to replace them with an e-alternative, but to combine the richness of turning pages with the utility, interactivity, and availability of mobile applications. Maybe John’s book would be a place to start. Next year I will be walking around Wales following the Wales Coast Path that opened this year and Offa’s Dyke long distance path up the borders. This is partly a personal journey reconnecting with the country of my childhood, but also a technological journey investigating the IT needs of the walker and the local communities through which I pass. Some of this will be mundane technologically speaking, but hopefully transformative in practice. However, I also expect to be pushed to the limits cartographically and theoretically. In particular, aspects of Semantic Web and the odd Galois Connection will be essential parts of the need to synchronise data between heterogeneous sources and following disconnection. This entry was posted in general and tagged swansea, talks by alan. Bookmark the permalink.